Regardless of age, gender or church affiliation, 90% of young adults say that accepting people is more important than agreeing with them. In 2010, two hundred and thirty young Christian adults were asked the tough questions. For those born in the late 1980s and 1990s, the world has been marked by pluralism, relativism, technological innovation and mass consumerism. This world they have inherited has had a huge impact on what they believe and how they behave. What the researchers found in this generation of youth was a willingness to stretch personal beliefs and behaviours in order to accommodate the differences of others. A disposition of acceptance has been drilled into young adults. What is the rippling power of acceptance? Or does it open space for dialogue? Or does it protect us from attitudes of superiority? 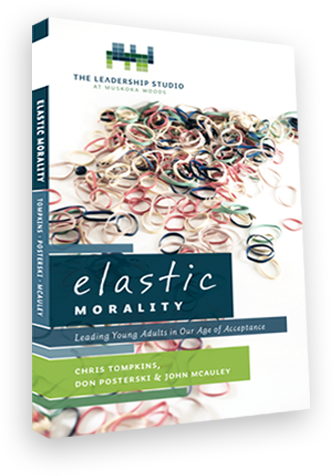 Elastic Morality is the story of these young adults and how leaders can inspire them to live lives of consequential faith. Chris serves as Managing Director of Muskoka Woods where he leads a team of 300 high school and college aged staff each summer. He recently co-authored the published research findings of “What’s Happening: The state of youth ministry in Canada.” His current role and expertise generates a demand for him to speak to teens and consult with adult youth workers. John is president and CEO of Muskoka Woods – a Christian youth resort in Canada. He also serves as a member of the Arrow Leadership faculty and a lead facilitator of The Leadership Studio at Muskoka Woods. An adult learner, John recently augmented his credentials in Organizational Leadership by completing his certification as an Adler Trained Coach. Don is a nationally acknowledged researcher and author who has devoted his career to interpreting social trends and their religious implications. Utilizing research data, Don has written and co-authored several influential books connecting the gospel with youth culture. Elastic Morality is a portrait of a generation painted from a palette of values unlike that of previous generations. It articulates a moral trajectory that is taking young adults of today into places their parents and grandparents would find unfamiliar. The book provides a lens through which thoughtful readers are invited into the heart of what drives 20-somethings today. In order to effectively reach the emerging generation, we must first come to an understanding of who they are and what they believe. Chris, Don, and John provide us with a compelling window into who young adults are and how to best instill in them a faith that has deep and reaching consequences. I’m recommending this book to youth workers, pastors, educators, and parents! Elastic Morality is a timely work that takes a piercing spot light and shines it right into the middle of the cultural whirlpool of diversity that young Christians are growing up in. The book profiles an emerging generation that won’t stand for insipid half truths and conservative straitjackets. Without judging or lecturing, Elastic Morality maps a strategy for how to engage this generation in the ad- venture God is calling them to. The crisp, insightful survey of youth culture in Elastic Morality is as troubling as it is unsurprising. Many of us have seen the increasing influence of this “elasticity” impact in every nook and cranny of adolescent life over the last three decades. This book wades deeply into the world of young people, recognizing that we can’t fully understand the waves and currents of their world by watching from the safety of the shoreline. The “See-Stretch-Support” paradigm provides concrete ways to respond to those who stray into spiritual danger zones. We’ve never had this research before. It’s like having a new window into the hearts and minds of today’s young people. For those of us who deeply desire to intentionally support today’s young adults as they move toward living a tangible faith, this book is an invaluable resource. Elastic Morality is a brilliantly sharp picture of Canadian, postmodern, youth culture. Let this book be your indispensable tool for making a difference with our young adults. It is essential reading for any youth worker. Acceptance is neither compromise nor approval. It is simply the foundation for all productive relationships. Agreeing or disagreeing with the world in which we live is not the point. Understanding it is if we want to effectively draw young people to the love of God. Elastic Morality is a valuable resource in understanding and reaching out to our young adults. Those working with youth and young adults need this book. This documentation of relativistic values and expressions of faith among youth leaders is essential reading for those who value effective ministry. Elastic Morality offers a tough dose of reality. But the authors passionately and creatively reflect on responses to find solutions that preserve the integrity of Christian faith.